The 15 Best Camping Spots in Rhode Island! When life in town feels a bit too crowded, you can always take to the great outdoors of Rhode Island for an escape. Woodlands cover over 60 percent of the state’s area if forest camping appeals to you. And, if you’re lucky enough, you might even be able to camp near the seashore! This popular campground provides the perfect seaside village environment. 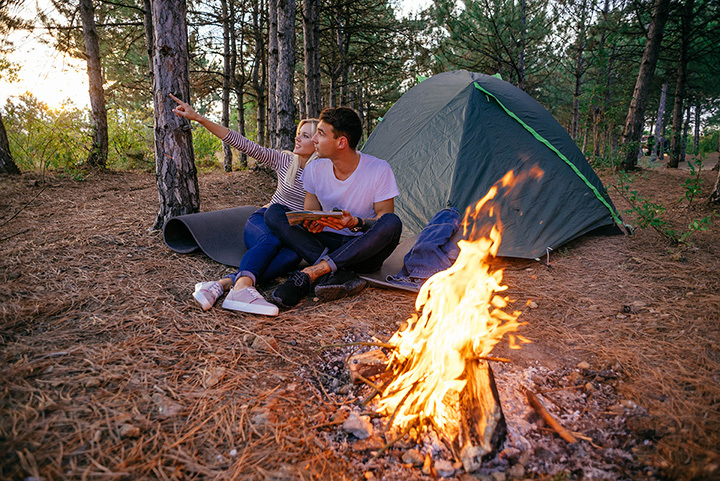 Your family will love camping on the freshly cut grass and its proximity to so many state beaches, as well as the Block Island ferry. This campground can be found right next to Watchuag Pond in Charlestown, a scenic little body of water hidden in miles of rocky forest area. They offer 50 fireplaces, toilets, have clean drinking water, and a swimming beach right nearby. You’ll feel lost in a forest of evergreens as you camp away in this beautiful campsite. Hikers and fishers will love this space, which covers an area of 3,489 acres and is located on the shores of the Bowdish Lake Reservoir. Campers will enjoy this location’s rustic, seaside feel. Camp alongside the beach and its sand dunes, and then spend all day splashing away in the ocean. Bowdish Lake brands themselves as “more than just a campground,” but a “summertime community of family and friends.” And with this site’s large, private grounds, you’ll feel like you get the best of both meeting new people and having time to relax for yourself. Offering a rocky beach, public boat ramp, as well as a dock, this location is best suited for recreational vehicles but you may also camp in tents in a small area nearby. Take a moment to stop by the wildlife observation platform just a small hike away from the site. Located just five minutes from Newport and its beaches, you’ll find this campground’s location perfectly picturesque, whether you are in an RV or a tent. This is a great place for camping and hiking. Breathe in the sea air and walk along the 1.5-mile ocean loop, or go bird watching at the nearby bird sanctuary. Looking for a more, well, unique experience? Dyer Woods calls itself a family friendly nudist resort. Their campsite includes a pond and hot tub for swimming, as well as a hot tub, sauna, walking trails, and a nature preserve—clothing always optional. Ginny-C celebrated their 50th season this year! With swimming, fish fries, recreation halls, volleyball, and basketball, it’s no wonder this campsite has been in business for so long. Locals and visitors from out of town love this campsite! Located in the beautiful Hope Valley, it’s a primitive campground but one that will have you wishing for a simpler life. This campsite has been family owned and operated for the last 45 years. Catch beautiful sunsets over the pond from your recreational vehicle—this site doesn’t have places reserved for tent campers. This quiet, welcoming campground has just the amenities you need—including a small store and swimming pool. Often the management throws fun events for families like movies and craft nights. Within walking distance to the beach, those seeking a weekend by the seaside will love this simple campsite. It’s great for swimmers, sunbathers, and fishers alike. Visitors love Whispering Pine’s friendly staff that put on lots of activities for every age! The facilities are clean, and include everything from an arcade to basketball courts.